I spotted this amazing red Onderwater right away. What a beauty! 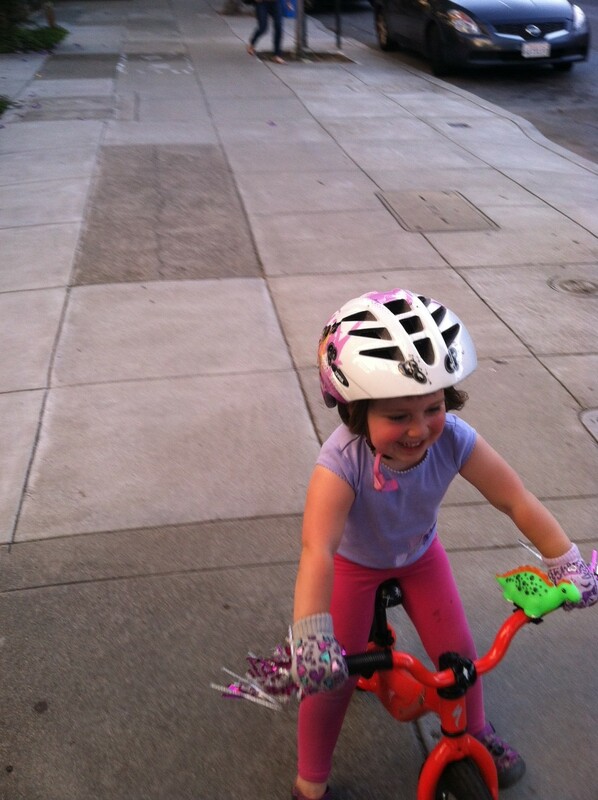 There are some insanely awesome family bikes in San Francisco. Granted, to the best of my knowledge no one in the city is hauling seven kids on a Bakfiets (although I hear there are a couple of Bakfietsen in San Francisco, in the Mission). However the fabulously varied terrain of the city has led to all kinds of family bikes on the move. 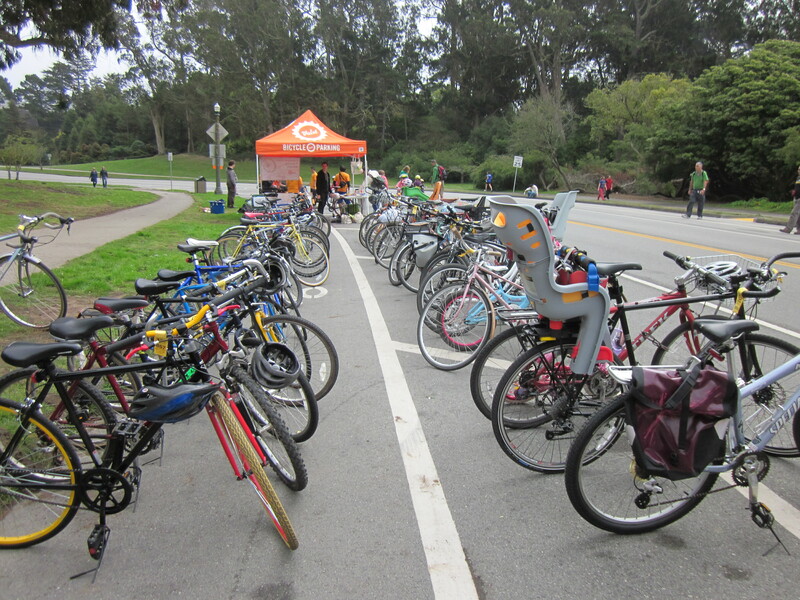 We saw many of them at the SFBC Family Bike Day last Saturday. My kids’ lust for a tandem has not dimmed in the last year, so we were all very excited to see our second Onderwater family tandem, now roaming the streets of San Francisco. This bike is so cool. The dad who rode it had gotten it from My Dutch Bike, and said that having the kids in front made a world of difference in riding with them. This was their school commute bike. It was amazing. Almost as obscure was the now-discontinued Joe Bike Boxbike, which was evidently purchased sight unseen two years ago and shipped to the city from Portland. Most of the family bikes, like ours, were basically bikes with a child seat slapped on the back: child seats are a cheap and effective way to get a kid from here to there, but they lack some style when stacked up next to the dedicated family haulers. The Rosa Parks crew was also there in force, some with bikes and some looking for bikes. Over the course of the day, as bikes came and went, I must have seen a dozen orange Yuba Mundos; a couple were assisted, including the unstoppable BionX Mundo that we see most days on the way to school. I am continually impressed at the way that Yuba has hit a price/functionality point that is getting so many families on bikes. 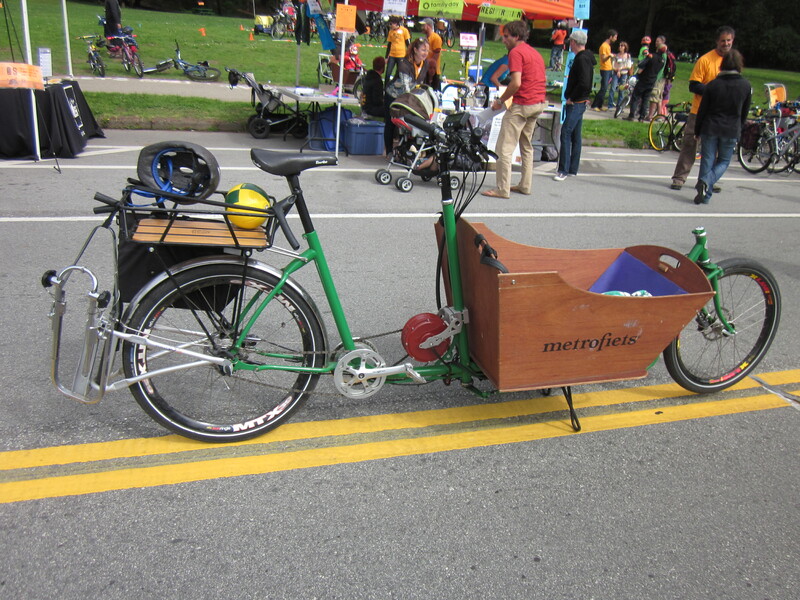 The Metrofiets had it all. In the One Family Bike to Rule Them All category was the Metrofiets that showed up later in the afternoon, complete with (now discontinued) Stokemonkey assist and Follow-Me tandem. Jaws dropped. There is nowhere that bike cannot go. It got so much attention that I realized it must be a real burden sometimes to ride a bike that is such a work of art. I get enough attention as it is just on the mamachari and the Brompton, which are pretty weird by themselves, but they aren’t in the same class. My son was a little short for the blender bike, but pedaled on for the promise of smoothies. 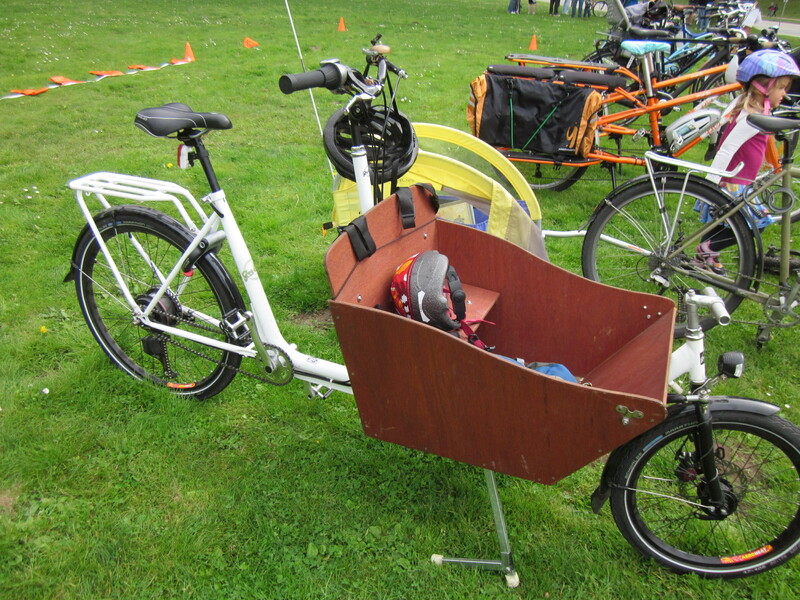 The Family Bike Day was partly about showcasing family bikes, but it wasn’t just a roll call. 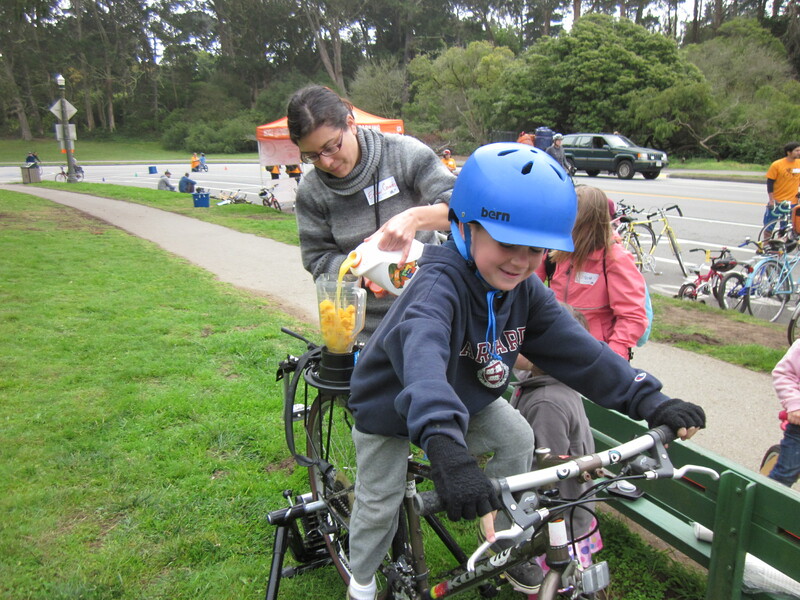 The SFBC had brought a bike blender, and my son was so delighted that he made four smoothies on it, stopping only when he got so tired that he smashed his crotch on the top tube. That was a bad moment. There were classes on Biking While Pregnant (pro tip: raise your handlebars) and Biking with Toddlers (world’s easiest class to teach: “Let’s go look at all the bikes people brought”). At one point attendees were asked to organize by neighborhood as a way to make friends—alas, we were the only representatives of the Inner Sunset, so ultimately we formed an unofficial alliance with Rosa Parks parents from the Haight and the Presidio. My kids bought t-shirts and played in the grass. I ended up talking with a lot of the volunteers from SFBC, one of whom commented that it was frustrating that San Francisco was so far behind Portland in family biking. “Half the people here bought their bikes in Portland,” she sighed. “Uh, we just did the same thing,” I admitted. The reason why is pretty obvious: Portland has three bike shops targeting family biking, and San Francisco, well, doesn’t. We went into one bike shop that got annoyed when we tried to try out their demo child seat by putting my daughter into it (*cough* PUBLIC! *cough*) However I think that child-friendly bike shops are the result of the city becoming friendly to family biking rather than the cause of it. Several years ago, Portland started aggressively putting in bicycle infrastructure that felt safe enough to draw families. (Plus it’s mostly pretty flat. Yes, there are some hills in Portland, but not on the same scale.) If San Francisco continues on the same path, why wouldn’t the results be similar? “I go so fast! Whee!” San Francisco still lacks routes that she could ride. Even so I see many, many more families riding in the city than there were even a year ago. I see it at our son’s school: the kindergarten class has more regular riders than the entire school did last year. It’s still primarily dads that I see on the streets with kids, but at Rosa Parks it’s mostly moms. More families appear on the streets and more lanes go in that feel safe to ride with kids, and then even more parents think about riding themselves. I talk to these on-the-fence parents every week. They want to try riding with their kids one day a week. They want to figure out a route that is safe for kids. If they live on hills, they are thrilled to learn that there is such a thing as an electric assist. I think my kids will be grown before this shift away from always driving with kids is complete. But I’m glad it’s happening. I can imagine how welcoming San Francisco could be with safe streets every day. We have traveled enough that I know what a city designed for people feels like. It would be worth the wait. ps: more Follow-Me tandems are on the way, and Stokemonkey’s coming back, and I think Xtracycle is going to strap a rocket to the kid-on-bike scene with EdgeRunner, electric or not. Those pictures are incredible! We felt much less isolated once our son started kindergarten–suddenly we were around other families all the time. And by chance we ended up in a school where many families walk and some ride. However it is very frustrating to watch the exodus of families from the city each year. Then when we were in Portland I was shocked to see kids’ menus. I had forgotten such things existed. We don’t know a lot of other car-free families in the city (I can think of only two offhand) but I find other parents’ reactions when they hear we don’t have a car fascinating. “Congratulations!” is the most common response. Yay for the Stokemonkey and Follow-Me tandem! And I agree about the Edgerunner, although the Mundos have a huge head start locally. The Boda Boda is also getting a lot of attention from parents with one kid (and we know many of those). can the onderwater go up SF hills? I asked the same thing! My Dutch Bike said “some hills” and the dad concurred. It wouldn’t make it to where we live or my office, but it works for their commute. I am the dad of the Onderwater triple tandem in SF and to answer some of the questions, last year I upgraded the front wheel with an electric hub and disk brake to handle the hills between our home in the Mission and the Haight, where my 9 and 6 year olds go to school. With this rig I expect I can ride them till their teens. Unfortunately, this morning, the bike was stolen out of our garage, electric motor, batteries, panniers, locked wheels and all. Along with 7 other bikes. It has been a devastating day and the kids are very sad that this morning’s ride may be our last on the beloved bike. 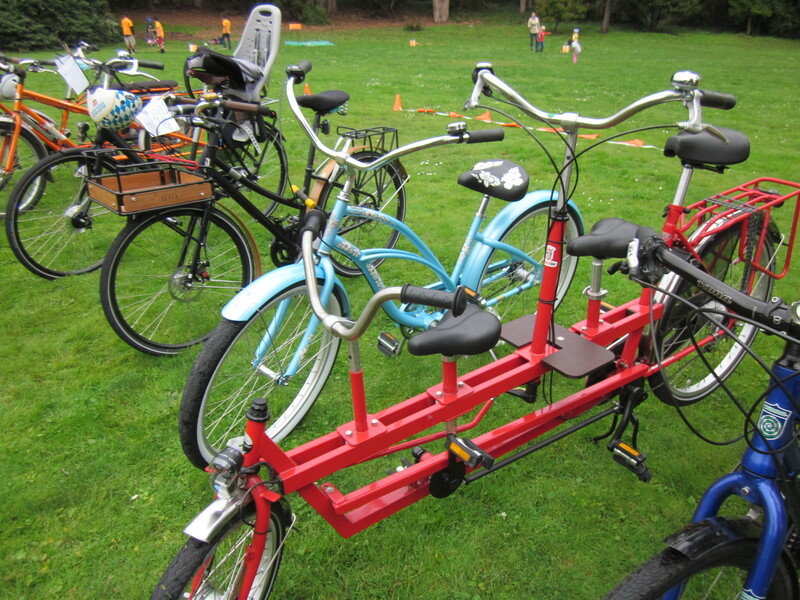 Please – If you see a red triple tandem on the road or in a shop, please post a comment here. I am following this thread now and am working through all the recommendations of what to do when a beloved bike is stolen. I am so sorry to hear this! It is terrible news. Our friends’ tandem was stolen last year (along with multiple other bikes) and they too were devastated. I really hope that you find it.